Is It Time to Become More Politically Engaged in Polk & Burnett Counties? Like it or not, politics--even local politics--has become more partisan. Important topics that affect all Americans such as health care, the economy and jobs, immigration, and recently, climate change, highlight the political divide. After the 2016 elections this partisan phenomenon has energized citizens, especially women, to become more politically active. Last month on the PBS News Hour, Elizabeth Flock presented a story about women in the rural West Virginia town of Buckhannon who became active by staging protests and holding meetings to present their counter point-of-view to the local majority. "Most of [the women] told me the only political participation they had up until this point was voting. Most of them had never held a protest sign. This was very new to them." Flock said. The women were encountering "push-back" in sometimes intense ways. What if the political climate is nagging you to become more active but you don't want to stage protests or carry signs? Maybe you want to make a difference in a less confrontational and constructive way. There is a new local outlet for engagement. Two years ago, a local group of women from Polk and Burnett Counties, began a journey to establish a new League of Women Voters in the St. Croix Valley. The effort mirrors what has been happening around the country. In a Washington Post interview by Colby Itkowitz, LWV National President Chris Carson declared, "There is a level of interest in the league that I have never seen in 33 years of involvement with the organization." Itkowitz wrote: "Carson thinks people are drawn to the league because it is nonpartisan--it doesn't weigh in on party politics, but it does take a stand on issues that effect voters. Its main purpose, though, is to engender the kind of active citizenship that is in sudden demand since the election. It encourages voting and champions civil discourse, putting out voting guides based on issues in communities and sponsoring political debates at all levels of government." The local league has made great strides in doing these important voter empowering functions. 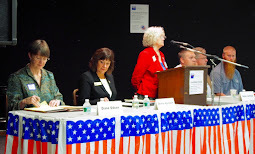 At the recent annual meeting, Chair Marilyn Chesnik presented a list of local league "firsts" that included: first voter clinic, first fair booth, first candidate forum, first candidate meet & greet, and more. Become more politically engaged by joining the League of Women Voters Upper St. Croix Valley. Support the league financially, sign up to help at an event, or join a committee. We welcome everyone.